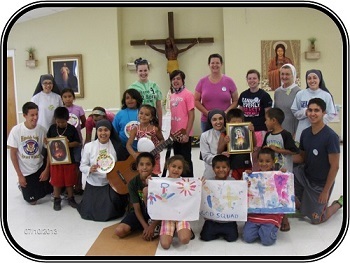 The Mission hosted a 3-day youth camp at Our Lady of Fatima Church in Macy over summer break. The theme of the camp was “The Spirit is Alive.” Preparations began months in advance with the help of speakers of the Leaven of Immaculate Heart of Mary Sisters (LIHM) and Oblate Apostles of the Two Hearts (OATH) Brothers from South Sioux City. 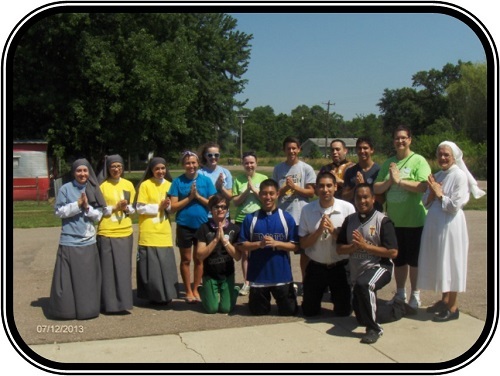 Sr. Ann and her friends lent their energy and enthusiasm to recruiting youth to attend the camp. Additionally, they kept on giving by providing snacks to the youth that attended . The children really enjoyed the treats! Fr. Dan Wittrack and Seminarian Rafael helped plan and organize all aspects of the camp after that, including daily mass. The program became a beginning catechesis because the children had not been baptized. The 3-day youth camp began with 7 and quickly grew to 11 by the end of the first day. Through word of mouth and interest from other children we had worked with more than 30 youth at the end of the three days. IT was inspiring when you think we had to compete with summer fun. It was a rewarding three days! Daily, we had delightful puppet shows, we were regaled with performance by the children. Even more importantly, we all learned about Jesus Christ and Mary. On the last day, there was a water festival, food, snacks and fun for children of all ages, including parents and grandparents. We hope that the memory of this event, as well as the experience we gained, will be a powerful incentive for all involved to go forward passionately with next year’s program.